Urban stormwater runoff poses serious risks to safety and the environment – and cities around the world are taking note. 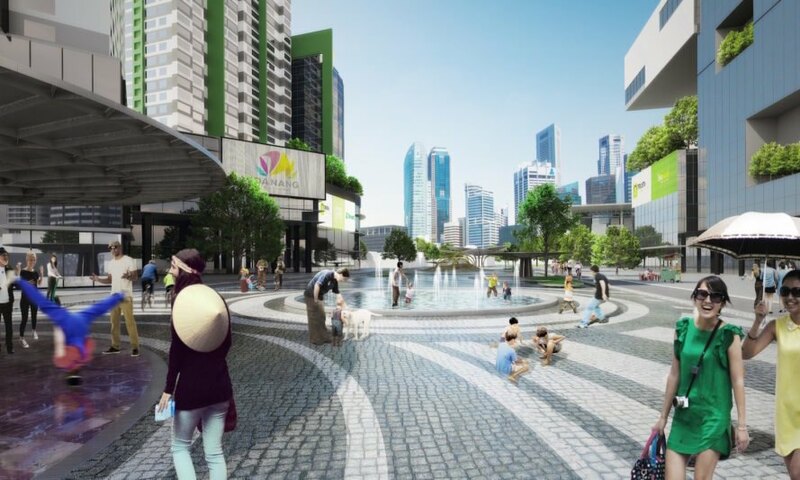 HUNI Architectes tackled Da Nang’s runoff footprint with their competition-winning design for the Da Nang City Center Square in Vietnam. Designed with SUDS (sustainable urban drainage systems), this attractive lotus flower-inspired square will create a vibrant public space and destination that collects and reduces stormwater runoff. HUNI Architectes’ design beat a shortlist of 15 proposals in a competition organized by the city as part of a greater masterplan to transform Da Nang into Vietnam’s most modernized metropolis by 2030. 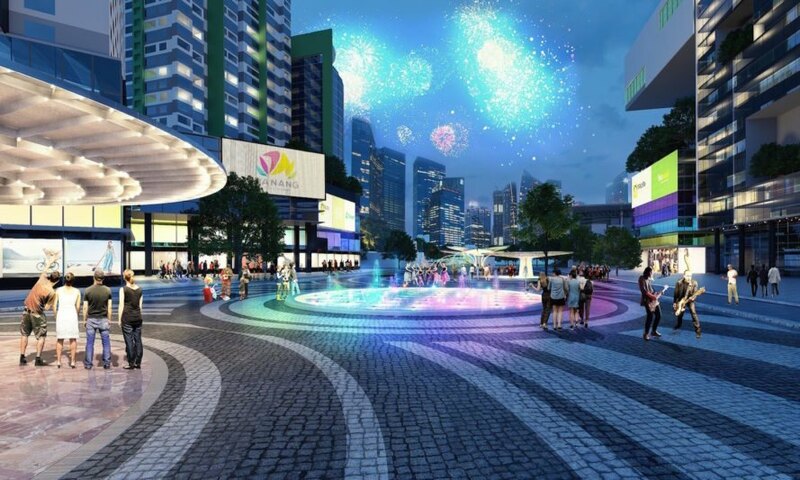 The architects’ vision for Da Nang City Center Square draws inspiration from Vietnam’s national flower, the lotus, which symbolizes divine beauty. 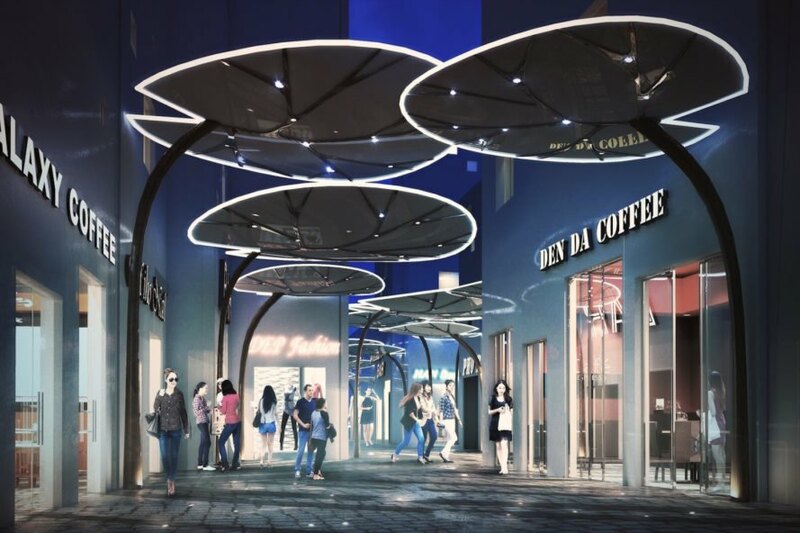 The plaza’s multiple shade structures take the form of giant lotus leaves, while a massive undulating canopy seems to reference the leaves’ gently crinkled shape. Circular granite paving patterns allude to ripples in a lake and are punctuated by circular grassy planters and lotus-pink play areas. Reducing stormwater runoff was a major goal of the design. Impervious surfaces like asphalt will be swapped out for pervious materials such as permeable paving and landscaping, while tree pits will be designed to collect, slow, and filter the flow of stormwater. 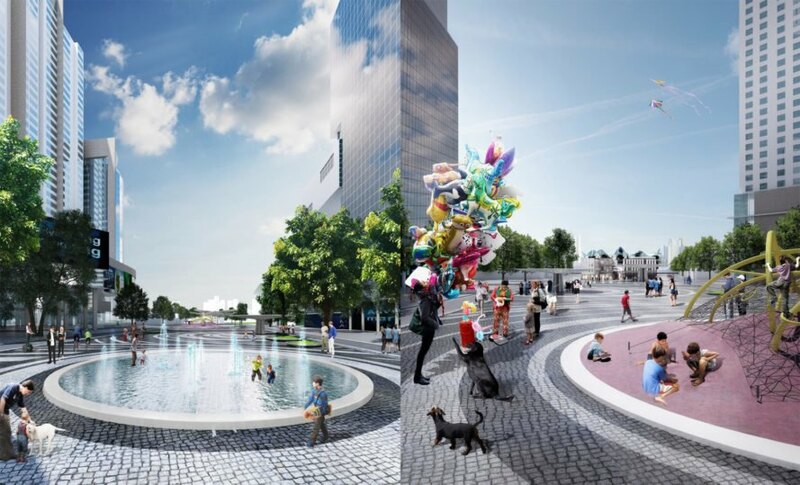 Water features and interactive fountains will double as SUDS (sustainable urban drainage systems) and can be enjoyed year-round along with lighting and performance sets. Related: Vietnam Constructs World’s Largest Dragon-Shaped Bridge – And It Breathes Fire! The contemporary new plaza is also sensitive to its historic surroundings. HUNI Architectes worked to preserve existing buildings on site, including the Han Market, which will be refurbished to increase its appeal to locals and tourists alike. To make the space pedestrian friendly, parking will be tucked underground and there will be easy access to public transport. 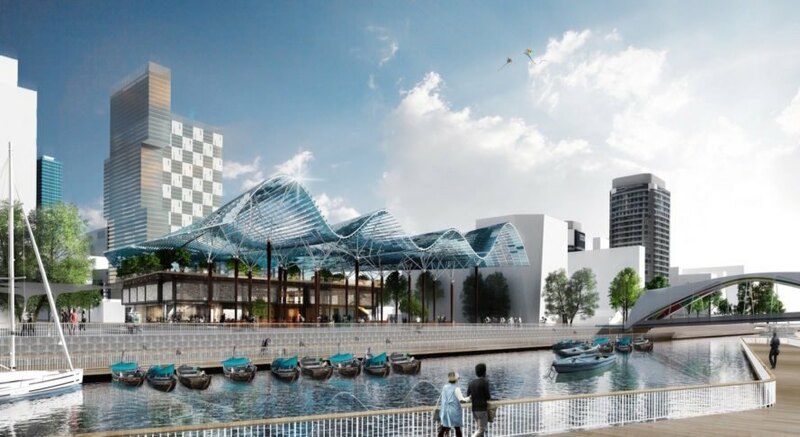 Bike sharing facilities will spring up in the “Mobility Hubs” at Han Market and cyclists will be able to enjoy a special lane shared with public transport. Urban stormwater runoff poses serious risks to safety and the environment and cities around the world are taking note. 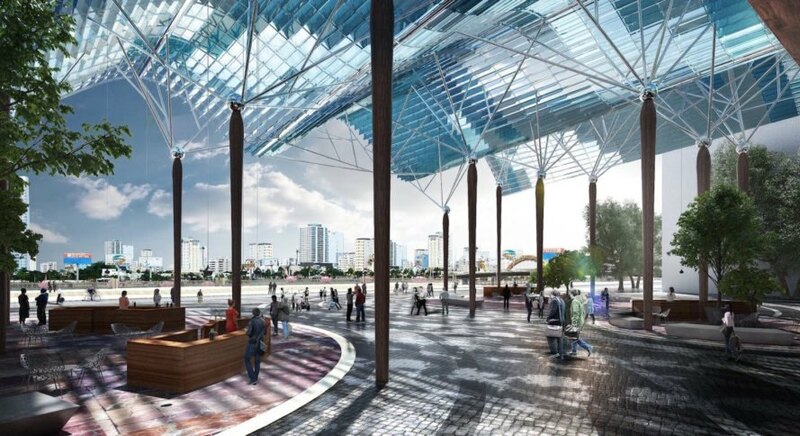 HUNI Architectes tackles Da Nang’s runoff footprint with their competition-winning design for the Da Nang City Center Square in Vietnam. Designed with SUDS (sustainable urban drainage systems), this attractive lotus flower-inspired square will create a vibrant public space and destination that collects and reduces stormwater runoff. HUNI Architectes’ design beat a shortlist of 15 proposals in a competition organized by the city as part of a greater masterplan to transform Da Nang into Vietnam’s most modernized metropolis by 2030. 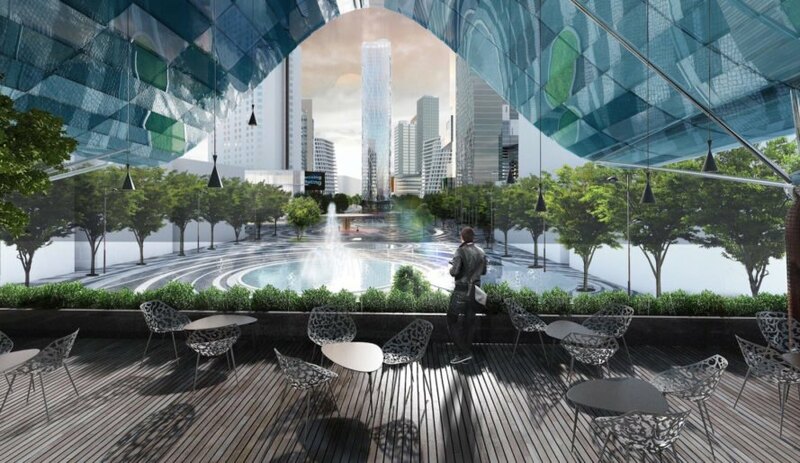 The architects’ vision for Da Nang City Center Square draws inspiration from Vietnam’s national flower, the lotus, which symbolizes divine beauty. The plaza’s multiple shade structures take the form of giant lotus leaves, while a massive undulating canopy seems to reference the leaves’ gently crinkled shape. Circular granite paving patterns allude to ripples in a lake and are punctuated by circular grassy planters and lotus-pink play areas. Impervious surfaces like asphalt will be swapped out for pervious materials such as permeable paving and landscaping, while tree pits will be designed to collect, slow, and filter the flow of stormwater. Water features and interactive fountains will double as SUDS (sustainable urban drainage systems) and can be enjoyed year-round along with lighting and performance sets. The contemporary new plaza is also sensitive to its historic surroundings. HUNI Architectes worked to preserve existing buildings on site, including the Han Market, which will be refurbished to increase its appeal to locals and tourists alike. To make the space pedestrian friendly, parking will be tucked underground and there will be easy access to public transport.